Just recently, Chevy aligned RS to represent more sporty appearance on the Cruze, Sonic, and Camaro. 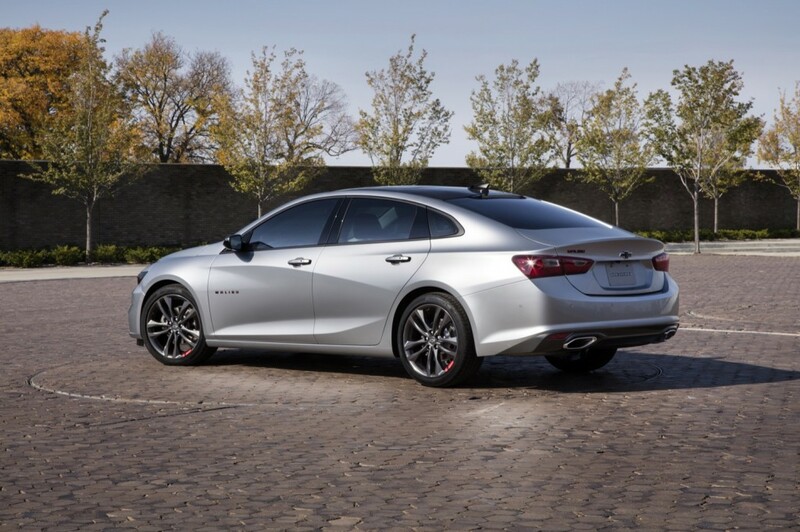 Notably absent from that list is the all-new, 2016 Chevy Malibu sedan — a great-looking vehicle that simply begs for deserves an RS appearance pack of its own. Just imagine a ninth-generation Malibu RS wearing a sporty yet elegant body kit, rear spoiler, and a nice set of five-spoke wheels (wrapped in either summer or all-season rubber) on the outside, along with a sporty steering wheel and shift knob on the inside. And, of course, RS badging would be an expected sight on the body and in the cabin, to boot. At SEMA last year, Chevy unveiled the Malibu Red Line Concept that subtly hinted at such a package, but despite rumors of production intentions, not much appears to have come from the effort. Recently, though, we learned that the 2017 Chevy Malibu got a new Sport Package that includes 18-inch wheels with summer tires and leather-wrapped 3-spoke steering wheel and shift-knob. Though better than nothing, the package leaves several desirable features out of the equation. To be clear, a Chevy Malibu RS would by no means represent a rival of the 325-horsepower Ford Fusion Sport V6. It would, however, represent an extension of the RS appearance brand that improves on the already-great looks of the new Malibu, catering to those customers who want more style in their midsize sedan, something that Kia has been doing to great success with its Optima lineup. In addition, a Malibu RS package would also boost Chevy’s profit margins on the Malibu. Seems like a win-win to us, wouldn’t you agree? Talk to us in the comments. My Camaro RS convertible looks great as an RS. Ye they need an RS Malibu. However while placing it on everything, it takes away from being special. RS is basically bigger rims tires spoiler lights So it’s really nothing special. Maybe so, but in that vein and adding to it the fact that there is no RS Malibu I think they need to do one. RS doesn’t need to be special, it just needs to look good… or look better than non-RS models. That said, RS will actually be more special than we think due to the simple fact that RS vehicles look better than non-RS and there will be fewer RS than non-RS models. Making RS vehicles even more “special” are high-performance versions, which currently are only available on the Camaro (Camaro SS RS). Imagine a Cruze SS RS, Malibu SS RS, etc… now *those* would be quite special and achieve that purpose. Cruze and Malibu would benefit more from “Redline”. Make them special on their own instead of slapping muscle car trims on them. I wa recently at a training session for GM and they mentioned they will be introducing a Redline Edition on a few models soon. The Malibu Redline looks even better in person. Skip the RS and just move to offer the Redline appearance package on all the models from SEMA last year. I wish they could find a way to leverage it globally to do something better than just appearance as I am tired of the stickers and paint packages. But to be fair just how much will people pay for an RS package vs. what it would cost to do one here and not share it with any other market? Holden and China share it but how many would you sell? Ford has Europe to share much of the same package but Chevy lacks this. They really need to find a way to leverage the cost some how. GM’s current attitude seems to be “go to Buick of you want a V6″‘ or anything else more than Pontiac “excitement” sport trim. Mary Barra suggesting that Impala could go away translates into “eliminate redundancy, but a Buick”, as well. Chevrolet MUST match & surpass it’s cross town rival if it hopes to match Ford on margins and street cred. The new Chevrolet products look great, are quality leaders, but even in the case of Premier, lack the old Oldsmobile-like content found on many rivals. Chevrolet is more than a value brand. I would rather the Impala move to where the SS is, offer a V8 and AWD and compete with the Charger in both civilian and PD markets. I sat in Malibu and thought it wasn’t really half bad. I’m not sure an RS package would do much for me. I’d prefer if some interesting colors emerged. A simple trick to make the car stick out from it’s competitors is to offer unique colors. I know a young lady who saw the Aqua and Neon Salmon Prius Cs and was half sold because of the color. I’m not saying Chevy has to go that wild but the current offerings are okay. No stand out WOW coloring — especially colors that might lure in younger conquest buyers. Just wait until that young lady returns the Prius and buys a Chevy Bolt EV or a Chevy Volt! My point was that the boring colors of the Volt would make her overlook it in the first place. And still would. This is hands down the best Malibu since the 1972 model ended but it’s still lacking. I still love the rear 3/4 Audi like profile but the front end is horrible and I don’t think a sport appearance package will help anything in terms of sales. And really, this car has zero sports cred… No AWD like Ford and no V6 like Ford either. Chevrolet simply doesn’t compete with Ford outside of the racetrack so it’s almost pointless to even compare the Malibu to the Fusion. There’s no comparison. Especially when you add in Titanium trims Ford has. I’m not saying I like it but it’s the truth. To Scott’s point above, Chevrolet isn’t global in the way Ford is so it’s not going to change either. GM just isn’t going to allow it. Anymore I’m finding myself more turned on by Buick and I’m a Chevrolet diehard (or was). I looked at the Trax yesterday for my wife and IMO it just looked frumpy and somewhat dumpy when sitting next to the Encore on the lot. It reminded me of the feeling I had when we looked at the 90’s Cavalier when new. A very cheap feeling and look about it. I couldn’t see buying the Trax after that but I’m just not a Buick guy so as much as I loved the Encore, I’m not sure I can pull the trigger there either. Not sure what we’re going to do yet. It’s the same way for me on this Malibu.. Sit it next to the new Fusion or LaCrosse and it just doesn’t compare in options nor looks for me. Both the Ford and Buick look sportier, classier and offer AWD plus nicer trims. I’m finding myself less and less enthused about Chevrolet save for the Corvette, Colorado and Volt right now. An RS trim won’t fix it either. I wish they’d get their cars and trucks (SIlverado) up to Ford/Buick/GMC levels. Even Nissan and KIA are getting my attention and I’ve never owned an non-American nameplate. Both of those are offering top trim offerings as well as AWD and some nice designs. Matt-Yes, no, sometimes; I strongly disagree regarding Fusion as does Car and Driver when the Ford ranks eighth verse Malibu at third right behind Accord and Mazda 6. You are correct about Encore. Chevrolet should be ashamed of Trax, and originality didn’t plan to sell it here. Buick gets great product that should be Chevrolet so to better compete and this is why Ford killed Mercury. Chevy should be linked with Opel. Buick should be building Avista, Avenir and Rivera concept-like vehicles handling the softer side of GM luxury and moving upmarket in tandem with Cadillac. Even in China Buick has outgrown its Oldsmobile space. You have posted the same ideas that I was going to post! Chevrolet has demonstrated how there’s more than one way to skin a cat with the vehicles it builds and while the most natural approach would be to drop in the LGX 3.6L DOHC-4v V6 that makes 335 horsepower; a more creative approach would be to borrow a page from Tesla and use the Malibu Hybrid as the starting point for the RS model by beefing up the electric motors and reprogramming the start/stop to use the electric motors during hard acceleration as this would give the RS performance without sacrificing fuel economy. People use to compare Ford’s Fusion and GM’s Malibu, lamenting that Malibu doesn’t have turbo 2.7 L V6, AWD etc etc. – Ford tends to pursue “one car fits almost all needs for everybody, as far as sedans go” goal with Fusion – that’s why is now has things such as 2.7 L EcoBoost V6 and AWD. – GM, in contrast, clearly means Malibu to be a budgetary, economical and fuel-efficient offering – in the first place (except maybe only Premier 2.0 trim). Mailbu’s body, in any trim, does not even have hood gas lift supports (or whatever they are called properly) – instead, like in good old times, it’s rod there, which is to be put manually to prevent hood from closing. Such a small thing, isn’t it? – but clearly aimed at weight and cost reduction. It just speaks for itself. Chevy needs to do more to the young at heart. I am a firm believer that an older person will purchase a sport tier vehicle, but a younger person will not purchase a dull looking, lack lustre vehicle. Given that , the Malibu should have a sportier, reasonable performance vehicle. The current Malibu looks too much like the Kia, and given the upgrades to the Kia, the Kia has better curb appeal. There is a huge difference in appeal between a Malibu with small rims versus the larger rims and that is only one example. It is time to push the accountants aside and let some marketing, sales folks put together the packages that go to market. It is better to sell lots of cars at a dlightly lower margin, versus fewer cars at a lower margin. Package the cars so that the owners feel good about driving them around versus only providing basic transportation. My wife and I are both retired and when we go out for a drive, we want to feel good in the vehicle we drive. A plain vehicle does not create that good feeling and makes consumers look to other solutions. I am not suggesting putting a huge motor, just a sporty look, inside and out, and good performance on regular fuel. And do not forget the Tuner market. Look what this group has and us going to their vehicles. First comes the rims, then the other external add ons. With a strong engine to build on the aftermarket folks will provide the performance needed. What they are looking for is a cool,car they can build on. As a retired person, I still enjoy driving a sporty looking car and I do not need 400+ horsepower. If I get 250 to 300 horsepower on regular gas, that will more than fill the bill. A nice sport package in the Malibu would be great, however it would be a lot better if the car had a V6 option. I really think GM should think about a Malibu in a two door coupe. I think it would bring younger buyers to Chevrolet. The last Malibu coupes were in the late 70’s and the last one was in 81, I have always thought they where great looking cars, they died as well as the El Camino, I guess I’m just old and still love the cars of yesteryear. I guess rear wheel drive is out of the question. Only Accord does a coupe, so you make a very good point. A Malibu coupe could serve as the foundation of a Regal Insignia Commodore coupe, as well. The Malibu is one of the more beautiful mainstream mid-sized sedans sharing bragging rights with Mazda 6 & 200. A coupe would be a great hook for younger shoppers. I’m. Really not a big fan of the new Malibu. I liked the 2013 design better. I’m not liking the curved fog lights and the rear is not that appealing to me. Maybe a coupe would change my mind. Really–8 generation was a failure. I love the Epsilon-based 7th gen and wish that Chevrolet had simply facelifted Lutz’s Malibu and sold the car until the current Malibu was ready. The “Sport Package” mentioned in the article is only available with the 1LT trim to give it a Premier feel and appearance. What is available and not mentioned is on the Premier there is a new “Appearance Package” for ’17. Gloss black rear views, dark chrome leading edge grill and Sport Pedals. Also new for ’17 on the Premier is the “Sun and Wheel Package” – 19″ Wheels and Sun Roof. So while Malibu may not have a RS package, Chevy did make some nice additions for ’17. What happened GM? You literally offer no performance oriented versions of any of your cars save the Camaro and Corvette which have a very limited and small audience. The Spark is a joke. The Sonic’s top engine is a 138 HP 1.4T that dates back to the first 2010 Chevy Cruze. The all new Cruze only has one 153 Hp 1.4T that doesn’t feel very peppy at all. The new Malibu is limited to a 250 hp 2.0T which is less power than it made in 2013. The Impala’s top engine is an old design 305 hp 3.6. The SS is basically gone so it’s not worth even talking about it and Chevy appears to have given up on it. The SIlverado offers a 6.2 with 420 hp and an 8 speed transmission but just try finding one. And it is very limited and only offered on the luxury trims. The refreshed Traz is still using the old weak 138 hp 1.4T without even offering the optional new 153 hp version that Buick offers on the Encore. The Equinox also takes a step down on power ratings for 2018 with only 170 and 250 gas engine available. And just try getting a 6.2 V8 in the Tahoe or Suburban 1500 series. Nope. Lets now contrast Ford’s performance lineup which puts GM’s to utter shame. There smallest car, the Fiesta offers a 197 hp 1.6T in the ST trim hatch. The Focus offers an ST and RS model with 2.0T and 2.3T engines that make 252 and 350 hp. Then there is the Fusion which has the Sport model that makes 325 hp from the EB 2.7 V6. Even the old Taurus offers a SHO models with the 365 hp 3.5 EB V6. The Explorer and Flex has this engine too and even the Edge has a Sport model with the 315 hp 2.7T engine. I still don’t understand why Chevrolet can’t give us a coupe either a Malibu or a Cruze and beef it up a bit. I had a Z24 and was very happy with it. The cobalt had a great SS. What do we have now? No choices except a Camaro.